With the Formula 1 season of 2015 in full swing we are celebrating motor racing, speed and vintage cars from across Europe. People have always strived to go faster. We modify everyday cars, build purebred racing machines, and perfect the pinnacle of automobiles: the Formula 1 car. But let’s not forget that your car is also a statement. Whether you prefer vintage cool or serviceable chic, maybe you favour a BMW, Citreon or Skoda? They’re all here for you to admire. Get ready for the excitement of speed, a look at the evolution of car engineering and design, and 15 cool videos about the history of racing. From the early Grand Prix’s in Monaco, France and Austria to vintage cars racing in the mud in Denmark; and from catastrophes at Le Mans to triumphs at the Rally Femina, and much more. Enjoy browsing through the collection and discover more on the EUscreen portal. And stay tuned for more collections coming soon by following us on Facebook and Twitter. We welcome you to take a look at our previous collections for more EUscreen content; Euroean Celebrations, Women’s Rights in Europe, European Theatre, All That Jazz and Film Festivals of Europe. 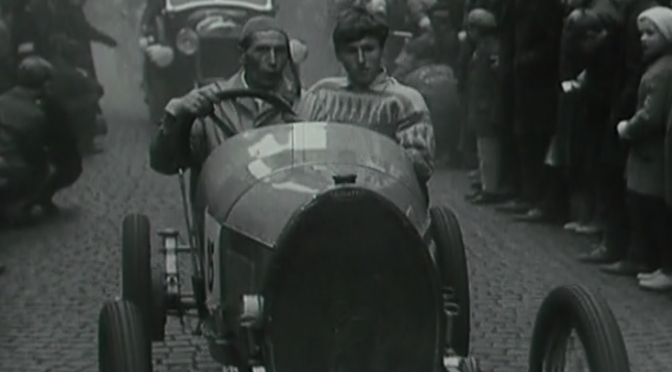 Get ready for a race around Circuit de Spa-Francorchamps with Lucien Bianchi. Veteran car race on ice in 1920! Veteran car race on a ice-covered lake in Sweden. Footage from approx. 1920. Veteran motor vehicles met in Nerudova Street in the Lesser Town, Prague. A report on how wind and water have been scientifically applied to improving conditions for cars competing in Formula 1. Automobile club in Holice held a competition for women called Rally Femina. 30 crews took part in a competition of racing and motor control. Vintage motorcycles race in Frederikssund. Television essay about the Republican Championship of car racing in Kačerginė. Footage from the prestigious 1956 Monaco Grand Prix. A report on the spectacular accident which took place during the Le Mans 24 hour rally; Pierre Levegh’s Mercedes explodes causing 80 deaths and 100 injuries. Who said you can’t race in a gravel pit? Citroën CV2: a workhorse that can plough, pull loads or transport the family donkey or the family on a day trip. Veteran cars racing through fields and dirt roads. The 45th Motor Show is opened in October 1958 by the President of the French Republic, René Coty. A variety of new car models are on display, and so are a whole host of music and movie stars. Racing enthusiasts and Austrian celebrities test their skills at the very first Go-kart race in Vienna, in 1960. The start of the second Austrian Grand Prix Formula 1 race at the Österreichring in Zeltweg (today better known as the Red Bull Ring).